(Grades 3-5) Cut larger, close-up pictures of symmetrical faces from magazines. Cut these face pictures in half and give half a face to each student to glue to a piece of white paper. Kids draw the other half of the face to match. This project is a little hard for younger kids but some second graders can do it successfully. Check with the teacher. (K-2) To make this project easier for younger artists, draw a very simple line drawing of half a face in the center of a page. Give the class copies of this to finish and color. (All grades) Bring in a several small mirrors. Have the class observe themselves in a mirror and turn different ways—side to side, up and down—to create both Asymmetrical and Symmetrical BALANCE. After discussing BALANCE, display all the packet pictures at the front of the room and ask the class if all of the portraits are Symmetrical. The only two faces that are completely facing the viewer are Pinkie and Blue Boy. All of the other faces are slightly turned, or completely turned, so they are not exactly the same on both sides. Some form of portraiture is found everywhere in art. Sometimes it is in the form of masks. Totem poles are forms of facial imagery also. In the fourth Dynasty of the ancient Egyptian Empire, facial likenesses were ordered to be included in burial mounds. Death masks are another form of portraiture seen in many past and present cultures of the world. Lifelike portraits were part of Ancient Roman Culture and people there, as in many other times and places, believed that likeness preserves the soul. Much portraiture has been of the general kinds, in which universal forms and proportions were sought. Most every depiction of any man or woman looked like the same man or woman, except maybe for the details, such as clothing, hair or beard. These portraits had a cartoon like appearance and they looked flat and lifeless. Most Medieval Biblical painting was like this. Portraits as we know them, drawn from life, were developed in western art by fourteenth-century masters. Leonardo da Vinci and Dominico Ghirlandaio were leading masters of fifteenth-century Forence (Michelangelo apprenticed with Ghirlandaio) during a time of intense demand for portraits. Leonardo made the crucial discovery of sfumato, which means allowing parts of the painted image to remain vague and shadowed. This is what gives the Mona Lisa its extraordinary look of reality. Since that time there has been a continuing demand for portrait artists in western societies. These commissions have always raised certain delicate problems. How much should the painter flatter the sitter, for instance? What objects should be included and what personal characteristics should be either emphasized or ignored? Even today, photographers touch up or erase imperfections (scars, blemishes) in more expensive professional photographs. It is still important to people to appear as perfect as possible! In Self-Portraits, the artist doesn’t need to worry about these types of problems. A powerful intensity radiates from the great self-portraits of the master artists. Vermeer, Hogarth and Renoir used portraits as a form of great art. Through their portraits we are able to see today the habits, styles of living, styles of hair and clothing, as well as activities of people from different times of history, economic standings and different cultures. These artists seem to have had affection for the people of their paintings and created them with appeal that speaks to us today. These artist’s portraits were created in different countries and in different centuries but there is an appeal to these human beings that breaks time and culture barriers. Formal portraiture continues to support many artists but is not the center of artistic interest today as it has been in the past. In the 20th century, painters like Picasso and Warhol have diffracted, analyzed, duplicated and taken apart portrait images with new techniques and painting styles. Since the camera came into common use, a lifelike portrait image has not needed a painter to create it. Define portrait, or ask the kids to define the word. Picture of a person. It can be a painting, a drawing or a photograph. Does the painting show a certain mood or emotion? What clues tell you this? Does the painting have detail or does it just give an impression of someone? Does the painting look real or not very real? OR Is this a Realistic or Expressionistic painting? What are the clues? Is the person’s name mentioned in the title of the painting? What do you “see”, “hear”, “feel”, or “smell” in the painting? Are there any painted portraits (watercolor or canvas) or reproductions (printed copies of paintings) hanging on the walls? Any portrait engravings? Check the money in your wallet or piggy bank. (Display a dollar bill to the class) The portraits of the Presidents and Benjamin Franklin, which are found on paper money, are line engravings. If the person wanted to dress like a student or teacher in your school, what kind of clothes would the person be wearing? Would the look of the painting change drastically if the person were dressed in those kinds of clothes? Are there any clues to tell you when this painting was done or where this person lived? Have students sit in pairs to draw or paint portraits of each other. A variation of the above activity would be to have students sit in pairs and draw half of a portrait of their partner. When the first half is finished, trade with the other person and let them finish the other side of the portrait. The partner should do their best to copy the style of the original artist. The goal is to make the other side similar but different than the first side. When the other half is drawn, give the portrait back so the original artist can paint or color it. Both artists should sign their names on the art. These can make wonderful modern art portraits! Cut out photo portraits from magazines (black and white pictures will work best). Cut the portraits in half vertically. Pass out these “half portraits” out to the class. Each person gets a single half and glues this to a piece of white drawing paper. Students then sketch the missing half of the portrait on the paper. A variation of the above activity is to have kids cut a photo of themselves in half vertically and draw the other side. Create a cut paper self-portrait. Cut details from paper such as eyelashes and eyebrows. All details should be cut from paper, NOT drawn. Create a portrait using printed newspaper or old phone books. Have kids look through a pile of newspaper to notice the different patterns and colors. The “classified” section has a plainer type pattern that makes a good background for the face. Darker sections of the photos can be cut in smaller pieces and glued close together to create darker hair or clothing. Larger headlines cut into strips create a different type of pattern to use as “strands” of hair. These can be cut and layered in lengths to create an interesting hairstyle. The “yellow pages” would make great blonde hair and colored advertisements could be used for clothing. The eyes, nose and mouth should be cut from newsprint with different patterns than the background so that they will be seen when glued to the background “skin”. The center of the eyes can be cut from dark or colored paper sections. The plain borders of the newspaper (without print) make good background “whites” of the eyes. Lips could be either darker paper or red colored advertisements. Sir Thomas Lawrence was born in Bristol, England, in 1769. He was one of sixteen children and his father was a tavern keeper. Lawrence was a self-taught child prodigy and began his painting career very early. While still a young boy, he created pastel portraits of the nobility and important people in Bristol with so much skill that he was able to support his family (parents, brothers and sisters) from the money these portraits earned. In 1787, at the age of 18, Thomas went to London and entered the Royal Academy School of arts. There he learned to paint in oils. He admired and began to copy the style of the portrait painter, Joshua Reynolds. Lawrence became an associate of the Academy in 1791, and the following year was appointed Painter-in-Ordinary to King George III. He became a member of the Academy, in 1794, received a knighthood in 1815, and was President of the Academy, from 1820 until his death, in London, in 1830. Lawrence is considered to be the last of the great English portraitists and his work was unrivaled in excellence. In the Huntington art gallery, in San Marino, California, the painting by Thomas Gainsborough titled The Blue Boy hangs opposite the painting, by Sir Thomas Lawrence, titled Pinkie. The two paintings were never connected to each other in their beginnings. Lawrence was a baby when Gainsborough was painting Blue Boy, yet in modern days these two portrait subjects have come to be seen as a couple. Gainsborough painted The Blue Boy about 1770, which was about 24 years before Pinkie was painted. When Pinkie, or Sarah Goodin Barrett Moulton, was sent from Jamaica to England, in 1792, to attend school, her grandmother—Judith Barrett—missed her so much that she hired Thomas Lawrence to paint a portrait of Sarah. That way Judith would have the painting of her granddaughter to look at, in Jamaica, even if Sarah was far away at school, in England! Sadly, Pinkie died in 1795, before her grandmother received the portrait. It is not clear if her grandmother EVER received the portrait in Jamaica. It is known that 10 years later Pinkie’s brother, Edward, had the painting with him in London. 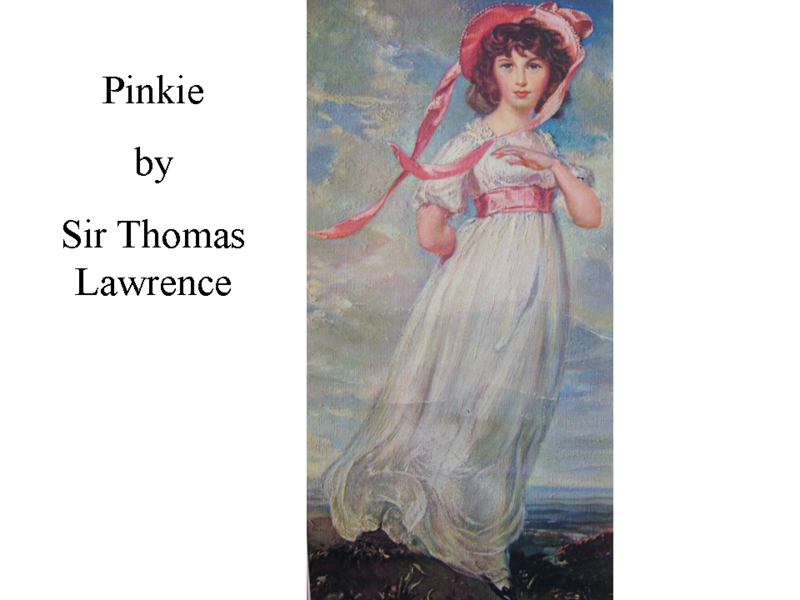 Years later, in 1806, Pinkie’s brother had a very distinguished daughter of his own. If Pinkie had lived, she would have been the aunt of the famous English poet, Elizabeth Barrett Browning! Why do you think people have always seemed to pair the two paintings? Lawrence admired and copied Gainsborough’s painting style, so the styles of the paintings are very similar. Could Pinky and Blue Boy have known each other in real life? Not very likely, they lived in different times of history. Their pictures were also painted by totally different artists. Knows how to be kind to a flower. Every time a boy plays in mud. In the Huntington Art Gallery in San Marino, California, the portrait painting by Thomas Gainsborough titled The Blue Boy, hangs opposite Sir Thomas Lawrence’s Pinkie. In the beginning, the two paintings were never connected to each other; Lawrence was a baby when Gainsborough was painting his Blue Boy, yet in modern days they have come to be seen as a couple. When Pinkie—or Sarah Goodin Barrett Moulton—was sent from Jamaica to England, in 1792 to attend school, her Grandmother missed her so much that she hired Thomas Lawrence to paint her portrait. Having a portrait of Sarah was supposed keep her Grandmother from missing her so much while she was so far away at school, in England! Sadly, Pinkie died less than three years later, before her Grandmother ever received the finished portrait. It is not clear if Pinkie’s Grandmother EVER received the portrait in Jamaica. It is known that ten years later, Pinkie’s brother Edward had the painting with him, in London. Later, this brother had a very distinguished and famous daughter. If Pinkie had lived, she would have been the Aunt of the famous English Poet, Elizabeth Barrett Browning! J We learned that a Portrait is a picture of a person or an animal. J We found out that a person’s face is SYMETRICAL. This means that a face is the same on each side if you divide it down the middle with an imaginary, vertical line. J We learned that an American named Henry E. Huntington bought both of these British Portrait paintings, which is why they are now on display together in California. Sir Thomas Lawrence’s portrait of Pinkie was really the portrait of Sarah Goodin Barrett Moulton. Sarah died at a young age and her brother, Edward Barrett Moulton (later Edward Moulton Barrett), inherited the painting of his sister. Edward was a very possessive and demanding father of 12 children. His oldest child, Elizabeth Barrett, was born March 6, 1806. Edward was loved by his children although he rigidly controlled their lives. Elizabeth never received any formal education but she loved to read. She read a lot and began writing poetry at an early age. When Elizabeth was 13, her father had one of her poems, which told a story about a hero (an epic), published. It was called The Battle of Marathon and there were 50 copies published. Seven years later, Elizabeth anonymously published another book of poems. At the age of 15, Elizabeth became very ill, from a nervous disorder, which was probably the result of a spinal injury. Her heart was permanently affected and she suffered headaches, weakness and fainting spells for the rest of her life. At the age of 20, Elizabeth anonymously published another book of poems and again, at age 27, she published one more anonymous book called Prometheus Bound translated from…Greek…and Miscellaneous Poems. Finally, at age 32, Elizabeth published her first book under her own name. It was called, The Seraphim and Other Poems. The critics loved her book and she was hailed as a new poet of “extraordinary ability”. During this same year Elizabeth became seriously ill again. Two years later, her favorite brother, Edward, drowned. This shock seriously aggravated her poor health. For the next five years she stayed in her room and saw no one except her family and a few close friends. Elizabeth developed an almost morbid terror of meeting anyone apart from this small circle of family and friends. Elizabeth’s name was well known in literary circles, although she became such a recluse. She was a respected and admired poet. At the age of 38, Elizabeth published a book called Poems. This book was very popular with the readers of those Victorian times and it made sure Elizabeth would be famous. The most important result of her Poems book was the beginning of her relationship with the poet, Robert Browning. After reading Elizabeth’s reference to him in this book, Robert Browning sent a telegram to her in January of 1845. He said: “I love your verses with all my heart, dear Miss Barrett. I do, as I say, love these books with all my heart and I love you too.” The two of them began writing letters and thus began England’s most famous literary love affair. At that time, Elizabeth was still very ill and confined to her room. Her illness had led her to feel “completely dead to hope of any kind”. Then on May 20, 1845, Robert Browning paid his first personal visit to Elizabeth’s house. Their friendship began to grow. Robert encouraged Elizabeth and made her feel happy and hope that she would finally begin to feel better. Elizabeth’s journey out of this despair, to hope and finally joy, can be traced in her letters to Robert Browning and in her Sonnets from the Portuguese. These were written during their courtship and beautifully expressed her love for him in poetic words. Because Elizabeth’s father had forbidden any of his children to marry, the couple secretly married on September 12, 1846. Elizabeth continued to live at home for a week before she finally told her family that she and Robert had married. In anger and frustration, Mr. Barrett refused ever to see his daughter again. When Mr. Barrett died ten years later, he still had not forgiven Elizabeth. Shortly after their marriage, the Brownings left England for Italy. Their son was born in Italy, in the spring of 1849. Throughout Robert and Elizabeth’s married life, they spent most of their days in Italy. After gradually declining in health for several years, Elizabeth suffered a severe chill and quietly died, in her husband’s arms, on June 29, 1861. Robert Browning reported that his beloved wife passed away “with a smile on her face”, because her life with him had been a happy one. 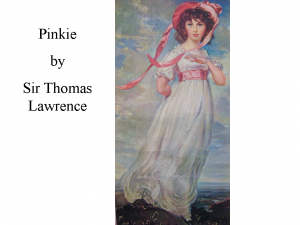 How was Pinkie related to Elizabeth Barrett Browning? What types of symptoms did Elizabeth suffer from when she became ill at age 15? How long did it take, after Robert Browning sent his first telegraph to Elizabeth, for the two of them to finally meet? Why did Edward Barrett refuse to see his daughter again, after she married Robert? How old was Elizabeth when she married Robert Browning? How many children did the Barretts have? Find a picture of Robert Browning and a picture of Elizabeth Barrett Browning and glue these to the bottom of this page. Had Pinkie not died so young, she would have been Elizabeth’s aunt. She suffered headaches, weakness and fainting spells, which lasted for the rest of her life. A little more than five months. Edward had forbidden any of his children to marry and Elizabeth had gone against his order. She was 40 years old, which was old enough to decide on her own if she wanted to marry. Elizabeth’s parents had 12 children and she was the oldest. Elizabeth lived to be 55 years old. Gainsborough was born in Sudbury, Suffolk, England, on May 14, 1727. His parents sent him to London when he was 14. Thomas spent five years studying art with an English designer and portraitist and with a French illustrator and engraver. When Thomas was 19, he married a rich heiress and painted portraits of the rich nobility, to earn his living. But Thomas painted landscapes for himself because he felt they were fun, much more fun than the portraits he was paid to paint. Often, Thomas would combine the two types of art to make the portraits seem more relaxed and less posed. In his 30’s and 40’s, Thomas painted many portraits and landscapes. In 1768, Gainsborough was elected one of the original members of the Royal Arts Academy. By royal invitation, he painted portraits of King George III and the queen consort, Charlotte Sophia. Thomas was the favorite painter of the British aristocracy and became wealthy by painting their portraits. He created more than 500 paintings in his lifetime and more than 200 of them are portraits. Gainsborough died in London, on August 2, 1788, at the age of 61. Thomas Gainsborough’s Blue Boy appears to be modeled after Anthony Van Dyck’s portrait George and Francis Villiers. 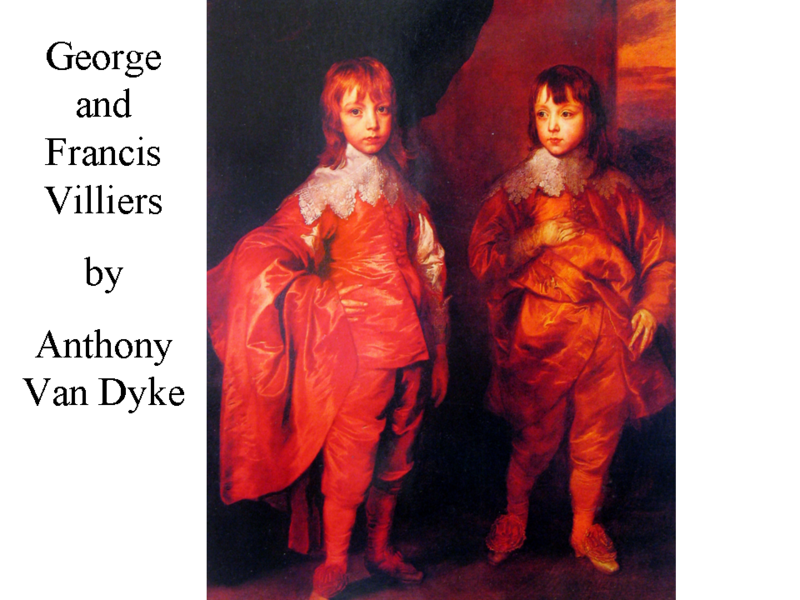 The painting combines elements of both boys’ stances from the Van Dyck painting. 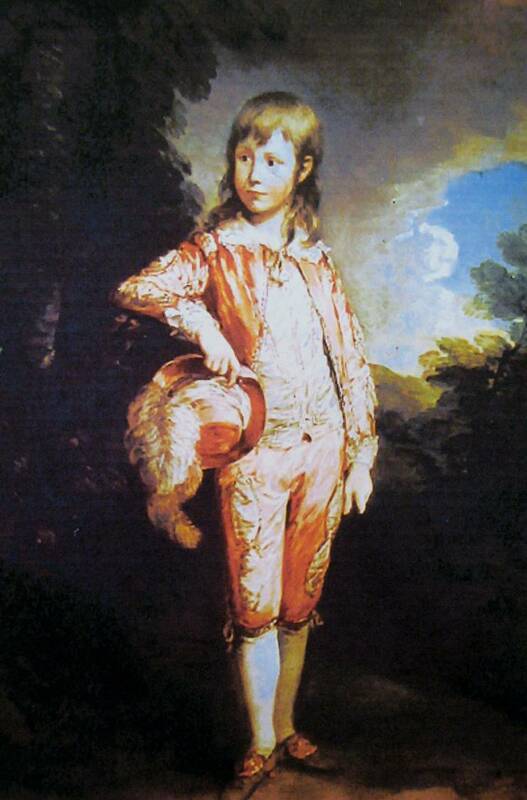 Gainsborough’s boy is wearing the costume of a cavalier—the dress in which Van Dyck depicted the family and the court of King Charles I, in the 1630’s. This outfit would have been very much out of style by 1759! Gainsborough didn’t just copy Van Dyck’s style when he created this painting. A striking element of the blue Boy is the contrast of light and dark—the way the face, for example, stands out whitely against the shadowy sky. The blue of the satin picks up highlights and sheens. The Blue Boy’s left foot, placed in front of the other, is also highlighted and pulls the bottom of the canvas forward, toward out eyes. Gainsborough sometimes painted in semi-darkness. He would close the shutters of his studio, or even work by candlelight. In those days, private houses were not very well lit. Gainsborough designed his images to compensate for the poor light found in his patron’s (or customer’s) homes. Often his paintings seem to glow in the dark. The boy in this painting is thought to Jonathan Buttall, the son of a well-to-do London hardware store owner, who was a personal friend of Thomas. Whether or not Jonathan’s father commissioned the blue boy (there is no evidence to date the painting or to reveal its reason for being) the picture seems to show a family friend of Gainsborough’s. X-ray photographs of the painting reinforce this view. They reveal the Blue Boy was not the first image painted on this canvas. Under the face is the beginning of another portrait, a picture of a man, older than Jonathan Buttall. (Show x-ray photo) It is very unlikely that Gainsborough would have set a used canvas on his easel, in front of his paying customer, to paint this portrait. Commissioning a portrait was costly, so no one who was paying that kind of money would want a portrait painted on a USED canvas! It is more likely that the sitter for this portrait was a personal friend. Gainsborough might have painted this portrait on a whim—just for the fun of it! The subject of the Blue Boy, Jonathan Buttall, inherited his father’s business and property, including the Gainsborough painting. Jonathan ran into financial difficulty, in the 1790’s, and his possessions were sold at auction. The Blue Boy passed through several owners before it was bought by an American, named Henry E. Huntington, for $728,000. Before being shipped to the United States, a coat of discolored varnish was removed from the painting. Varnish tends to yellow as it ages. This cleaning dramatically changed the painting’s appearance, especially its COLOR! 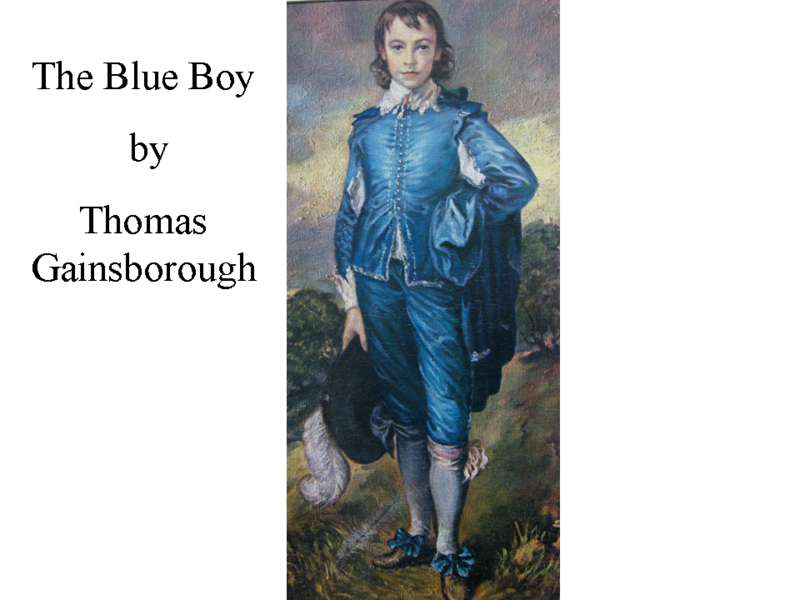 It seems Gainsborough’s Blue Boy was green, during the 1800’s! Display Blue Boy, Pinky, Pink Boy and George and Francis Villiers together, at the front of the room. Place cards above each picture, with the years each was painted. Compare the dates the portraits were painted. Discuss significant historical events that happened between these years. Discuss the different artists who painted the portraits. How are the portraits alike? How are they different? Point out the way the artist has shaded the leg of the Blue Boy, farthest away from the viewer. The leg closest to us has white highlights and is tinted a lighter blue. Why would the artist add more white to the leg closest to us? Satin reflects light. Adding white o the blue makes it appear the satin is reflecting more light. The leg with more shadow could not have as much light to reflect. Notice the shadows. Can you see the shadow that his hat casts? Can you see the shadow that the Blue Boy casts, on the ground behind him? Pass out the coloring page of the blue boy. DON’T make just coloring this page your project. This simple outline drawing of the portrait will make it easier for the kids to see how to draw a person in this type of pose. Bring in a satiny, shiny blue (or any color) costume for one of the kids to wear. Have them pose at the front of the room, for the rest of the class to draw. Instruct the model to stand with their left foot in front of the right (just like the painting). The kids can refer to the color page, in case they have problems figuring out the perspective for drawing this pose. Don’t forget a hat! Maybe you could find a fluffy feather to attach. The coloring pages are a good way to remind the kids about some of the points you covered. Pint an outline of the points you want them to remember on the back of the picture. Paint a watercolor landscape vertically on a piece of paper. Give kids the coloring page and have them color and cut the boy out. (With some kids you will need to point out which lines are parts of the background design. The contour lines of the boy are more darkly defined.) Let the kids know that they can use any color for the clothes that they wish. Once the landscape has dried, have them glue their (orange?) boy to their painted landscape. The boy in this Portrait is thought to be Jonathan Buttall, the son of a well to do London hardware store owner who was a personal friend of Thomas Gainsborough. Whether or not Jonathan’s father hired Gainsborough to paint The Blue Boy (there are no clues that bring to light the painting’s reason for being), the picture seems to show a family friend. X-ray photos of The Blue Boy gave art experts an important clue that led them to believe the boy in this painting was a close friend of Gainsborough. These x-rays revealed that underneath this painting is the beginning of another Portrait—a portrait of an adult man. Since it was so expensive to hire an artist to paint a person’s Portrait, it is not very likely that anyone paying for a Portrait would want it painted on a USED canvas! It is more likely that the sitter for this Portrait was a personal friend. The artist probably painted this portrait just for the fun of it! The subject of this painting, Jonathan Buttall, inherited his father’s business and property, which included The Blue Boy painting. When Jonathan had money problems in the 1790’s, his possessions, including this Portrait, were sold at auction to help pay his debts. The Blue Boy passed through several owners before an American, named Henry E. Huntington, bought it. Before shipping the painting to the United States, Mr. Huntington had the painting cleaned. This cleaning changed how the painting looked, especially its color! It seems that the varnish coating on the painting had so badly yellowed that, during the 1800’s, Gainsborough’s original “blue” boy had actually appeared to be green! The boy is wearing clothing that was the costume of a cavalier, a socially high-class gentleman from the court of King Charles I of England; a clothing style worn 100 years before this boy would have been born. This gave art experts another clue that the painting was just painted for fun, and not for profit. Thomas Gainsborough painted many Portraits and Landscapes. He liked painting Landscapes the best, but Portraits were more popular with rich people of his day, so very talented artists could charge more money for Portraits. However, this artist was smart enough to be able to still paint what he enjoyed most, by combining his Portraits with a Landscape background! The relationship of this painting to The Blue Boy is obvious. Both portraits were painted by the same artist. This artist patterned these portraits after the painting STYLE of the artist, Van Dyck. Just like The Blue Boy painting, this portrait is posed with the boy (Master Nicholls) standing in the same pose as the Van Dyck portrait (George and Francis Villiers). The artist has painted the boy’s clothing with the same radiant light on various TEXTURES—soft, shiny silk, fluffy ostrich feathers, and fine strands of hair—as he painted on his Blue Boy portrait. The boy’s face radiates with light against the darker background. Ask class to compare the faces of the two Gainsborough boys. The boy in this painting seems a little shy. How did the artist show this? Master Nicholls isn’t looking directly at us, from the picture. Does he seem nice? …Friendly? Can you see any other similarities between this portrait, the Van Dyck, and the Blue Boy portraits? The clothing styles are all similar. All of the clothing reflects light in the same way. The clothing on each boy is one main COLOR—MONOCHROMATIC. Have kids work with a partner. Each can pose in the same posture as the Gainsborough paintings. Each partner can sketch the basic outline SHAPE as the person poses. Once picture is drawn, paint the clothing in one COLOR (monochromatic). Demonstrate ways to add highlight, by creating lighter Tints of the color (adding white) or darker Shades (adding black). Tempera paint works better for adding Tints and Shades than watercolor. Anthony Van Dyck lived from 1599-1641. He was born in Belgium but moved to England in 1632. Van Dyck was the official painter of King Charles I, of England. He painted portraits of the royal household. This included George and Francis Villiers. The two boys were raised with Charles’ children, after the death of their father. Their father had been England’s Prime Minister, as well as the King’s closest friend. Van Dyck captured the arrogant attitude of George Villiers, from his scornful expression to his defiant pose. The younger boy, Francis, looks nervously at his brother and fidgets with his cape. In his lifetime, Van Dyck created more than five hundred portraits. He introduced an aristocratic painting style to a country (England) that had produced brilliant writers, such as William Shakespeare, but few talented artists. Discuss and demonstrate expressions which affect the MOOD of a portrait. Create two cartoon faces that illustrate different MOODS (happy, sad, laughing, or crying). Choose a COLOR for each background, which will help create the feeling or emotion you have chosen to illustrate (red-anger, blue-sadness, for example). 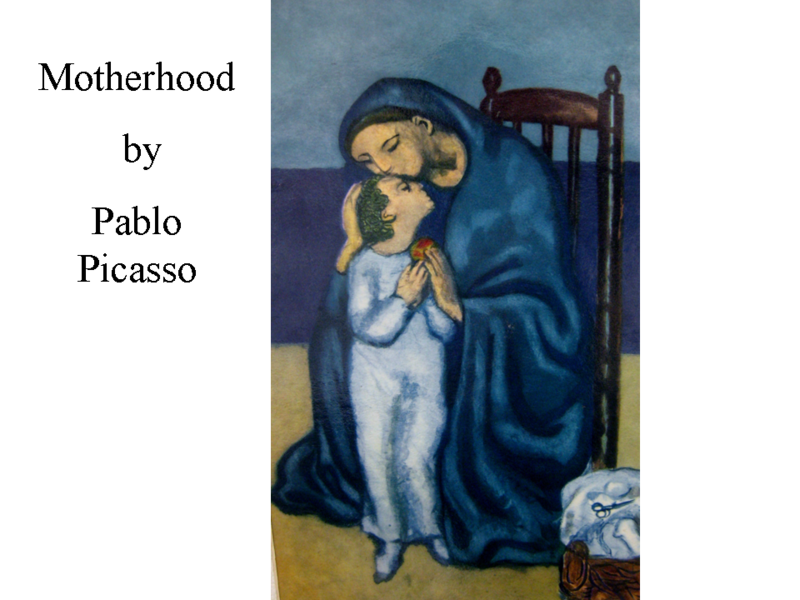 Pablo Picasso was born on October 25, 1881, in Malaga, on the Southern Mediterranean coast of Spain. He died in France on April 8, 1973, still vibrantly creative and full of artistic plans. Picasso’s father was an art teacher who encouraged his son to paint and draw. He thought his son had great talent and said that Pablo was the one in the family with all the talent. Pablo’s father knew that his son would be famous one day! When Picasso was 19, he left Spain and went to Paris, France. Some of the first paintings he made there look a little bit like the work of other famous French artists of his day. Then something happened. Picasso’s paintings changed. His work became different from anyone else’s. 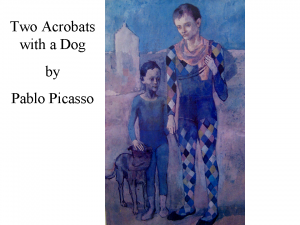 Then Picasso’s best friend died and he felt alone and sad. At the same time, none of his paintings were selling and he was almost starving to death. Because of his sad mood, Picasso began to paint with lots of blue. Blue can be a very sad COLOR. Picasso made the people in his paintings look lonely, forlorn and sad. They were usually poor people. This was Picasso’s first original style of painting and has been called his Blue Period (1901-1904). The paintings of this period remind us of feeling sad and lonely. Some people thought Picasso’s Blue paintings were great! Others, including his own father, thought these paintings were just too strange. This was the beginning of the artistic controversy that followed him throughout the rest of his unique and creative art career. People either thought Picasso was original and inventive or did not like his art at all. Picasso’s Blue Period ended when he met a girl named Fernande. Picasso and Fernande fell in love and soon a happier COLOR began showing up in Picasso’s paintings—PINK! This was the beginning of Picasso’s Rose Period (1905-1906), when he painted with lots of pink. Did you know that COLOR suggests feelings or MOODS? In hot climates businesses often paint their walls blue because it makes people feel cooler. Many restaurants use red because it is a color that is supposed to make you feel hungry. This is a painting about a mother and her child. What is the MOOD of this picture? Is it sad? The MOOD of this painting is relaxing and calm. Blue can also be cooling, soothing and calming. This picture doesn’t have the sad, lonely feeling found in most of Picasso’s Blue Period paintings. How does this mother feel about her child? She shows lots of affection for her child. The child seems to feel the same way towards the mother. The clues that tell us this is the way the child is leaning against the mother and the child’s eyes are calmly closed and relaxed. This child seems very secure with mom. Can you find any NEUTRAL COLOR in this picture? Point out the way the artist uses NEUTRAL COLORS in this painting. Discuss or demonstrate how an artist changes the SHADE or TINT (by adding black or white) to create different blue COLORS. The artist can also change the color by adding a neutral color, like brown. The name of Pablo Picasso is, without doubt, one of the most widely known names in the modern world. During the 92 years of his life, Picasso did more to change the meaning and appearance of art than any other man in the 20th century. He was a rebel. Even though Picasso knew how to paint like other fine artists, he preferred to change things, to make people think, to paint things that didn’t look like a photograph and to paint things that people did not agree on as “artistic”. This painting was created near the end of Picasso’s Blue Period. Picasso then moved on to his second original style of painting—his pink pictures. These were called his Rose Period paintings and they started showing happier things and happier moods than most of his Blue Period painting subjects. This painting represents the transition time between these two painting styles (Blue Period and Rose Period). 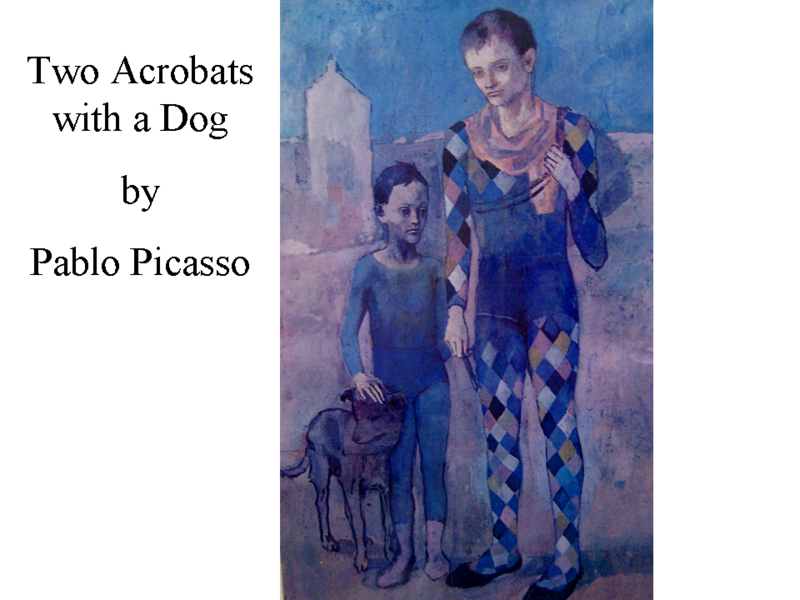 Picasso painted a lot of circus people during his Rose Period years. He often painted them with their animals (notice the boy’s dog). You can see hints of rose (pink) in this mostly blue portrait painting. The father has a rose scarf around his neck and some rose diamonds on his multi-colored tights. The boy has pink socks on his feet and the background seems to have a layer of pink, painted over the blue. Although Picasso has begun to use a bit happier COLOR (pink) in this work, the MOOD of the painting is still very sad. The faces of the boy acrobat and his father are sad. Both of their eyes are cast downward, hinting of sadness. Neither of their lips has a smile. Both are standing still and quiet. Picasso’s Rose Period didn’t last very long because he soon found a new way to paint that was really exciting and different. Cubism was Picasso’s third new style of painting, which he developed and it made him famous. J (All grades) Cut small rectangles of blue or pink cellophane and have the kids hold them over their eyes. Let the class observe how things in the room take on the TINT of the cellophane color. Everything seems to show up as a variation of the cellophane color (pink or blue). Explain that some artists make paintings or drawings using a single COLOR and its many variations. Picasso was one of these artists. (Grades 3-5) Explain that when they look through the colored cellophane they are seeing an analogous COLOR scheme (similar; a tint or shade of the same color). (Grades 3-5) COLOR can be changed in many ways. Adding black, white or gray is a common way to change a color. When you add black to a COLOR you create a shade. When you add white to a COLOR you create a tint. When you add gray to a COLOR you create a tone. Artists can also change colors by mixing a PRIMARY and a SECONDARY COLOR together—like red orange or blue violet. These are called INTERMEDIATE COLORS. (Grades 2-5) Choose one color that you will use in a collage. A collage is a two-dimensional design made of materials such as paper and fabrics glued to a flat background. Cut out many sizes and SHAPES (geometric and freeform) of the color you have chosen, from magazines, wallpaper, wrapping paper and/or fabric. Don’t cut out objects or people, cut out geometric and free-form shapes from pictures with large areas of your color. If you choose the COLOR blue, look for pictures in magazines that have large areas of blue sky. If there is a red house in the picture, cut it out and leave only the parts of the picture that are blue. You may also cut SHAPES from a section of a picture that has blue waves or blue jeans. Cut more blue SHAPES than you will need so that you can choose the shapes and sizes that will make the most interesting design. Arrange several of the clippings you have chosen on a sheet of white paper. Arrange and rearrange the pieces 2-3 times so that, while they create an interesting design, you can be sure they will also cover the entire white paper. When you have made an arrangement that you like, paste all the pieces of your analogous COLOR scheme design on the paper. This will be the background for your picture. When you finish the collage background, draw and color a PORTRAIT of a real or imaginary person on a separate piece of paper. Color the person with different tints, shades and tones of the background COLOR you chose. This portrait is going to be the FOCAL POINT or EMPHASIS of your artwork. Cut out the colored portrait and glue to one side of your background sheet to create asymmetrical BALANCE. Don’t glue your portrait directly in the center of your picture. You may also cut out letters that spell the color you have chosen and glue them on your collage picture. A variation for creating this background (previous project) would be to cover a piece of cardboard or poster board with puzzle pieces of the same COLOR. Bring in an assortment of brightly colored puzzles. Goodwill or Value Village carry puzzles at very inexpensive prices. Garage sales are also good resources. I recommend at least 5 or 6 1,000 piece jigsaw boxes for a classroom. This will speed the kids digging through the boxes to find puzzle pieces of the same main color. The more tints and shades of a color the better. Landscape puzzles work great because they have an abundance of puzzle pieces, in green (grass, trees) and blue (sky, water) to choose from. (Grades 2-4) Think of a MOOD you would like to create (sad, fun, warm, cold, evening, daylight). Draw a simple portrait OUTLINE of a person on a piece of light blue or light pink paper with a very light pencil. Make your portrait large enough to fill up most of the paper and add details (like clothing, hat, hair decorations, toys, furniture, etc.) Remember, this picture is going to create a certain MOOD, so you may want to show the person doing something that will help create the MOOD you have chosen (crying, laughing, sleeping, working, playing, riding a merry-go-round, etc.) Next, choose three COOL COLORS (blue, green and purple) of crayon to use on the blue paper OR three WARM COLORS (red, yellow and orange). Then, choose a white, black, gray and brown crayon—these COLORS are not found in the rainbow. They are NEUTRAL COLORS. These four COLORS will be blended with the three WARM or COOL NEUTRALS. On a piece of scrap paper, practice blending the neutral COLORS with your WARM or COOL COLORS. This will help you see if you prefer to press heavier with one COLOR or use the same pressure on both COLORS. Now, USING ONLY THESE SEVEN COLOR CRAYONS, color in your entire portrait, mixing the neutral colors with the warm or cool colors, in every area. Use your COLORS to help create a MOOD or feeling with the person you have drawn in your portrait. (Grades 3-4) Create a MONOCHROMATIC BACKGROUND by covering a colored (any) square of poster board with puzzle pieces, in a variation of the same color as the poster board. Bring in an assortment of brightly colored puzzles. Let the class look through the boxes to find about three dozen pieces of the same main COLOR. (This will vary with the size of your square.) The more TINTS and SHADES of the COLOR they find the better. This works best with a lot of different puzzles because ALL the skies can’t be exactly the same shade of blue, for instance. More kids can also be looking at the same time when you have more boxes of puzzles. pieces, it is time to create a portrait. become the FOCAL POINT of the collage. Repeat the same process in the three squares below, replacing white with black, to create MONOCHROMATIC SHADES. assortment of Tints, Shades and Values of Pink that one class can create!